PANCAKES Amsterdam has their own mill. A truly beautiful mill, situated in IJsselstein. 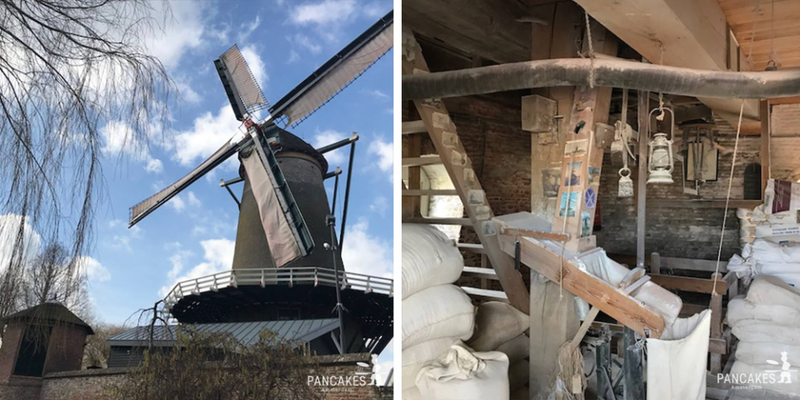 Since the opening of PANCAKES Amsterdam in 2007 we have been connected to this mill. A friendship that already lasts for over a decade, we think it’s quite extraordinary! The Korenmolen van Windotter is a family mill, which makes it extra special. And now, it’s also kind of family to us. This mill produces the base for anything made of grain. You can think of bread, cookies and especially for PANCAKES Amsterdam, they create the pancake flour mix. This windmill was already existed in 1732, but in 1984 the municipality bought the mill. They renovated it completely for 1.120.000 gulden and in 1988 Maarten Dolman started as miller. In 2004, the mill opened a special shop, so that individual shoppers could also buy their products. back in the days, the production started with around 83.907 kilos of flour per year.. Nowadays, they produce more than 250.000 kilo and Maarten Dolman is still in charge! After years of research, we found our ideal PANCAKES flour mix. Together with the miller Maarten Dolman, we have come to the secret recipe of the PANCAKES Amsterdam. We have our own special pancakes flour mix and also our gluten-free pancake flour mix. For all the pancakes fans, we sell our PANCAKES Amsterdam pancake flour mix in our restaurants. The main components of the normal pancake mix are whole wheat, buckwheat and white flour. 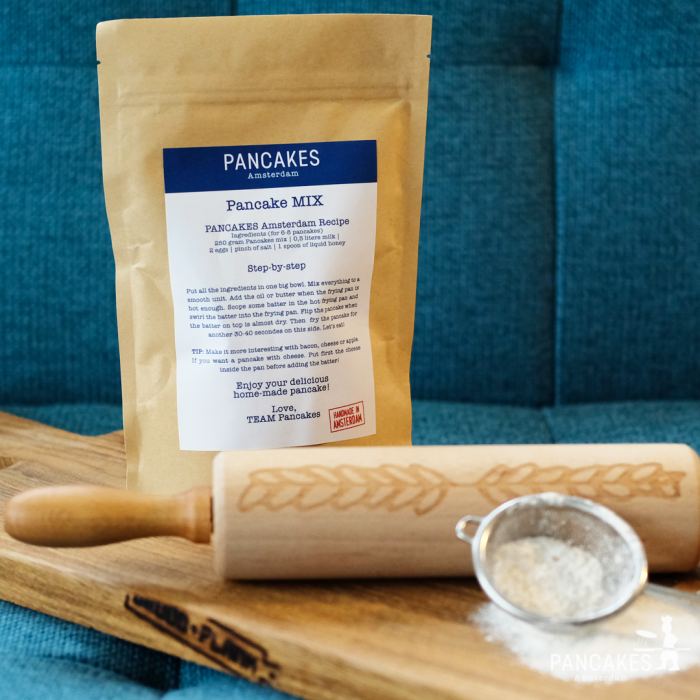 You can buy the mix in a the paper bag, along with the PANCAKES Amsterdam pancake recipe! This also applies to the gluten-free pancake mix. So, if you are not able to visit our restaurants on a daily base, just take the PANCAKES Amsterdam flour mix home! Spread the pancake love at home and give a Pancake Party for family and friends. 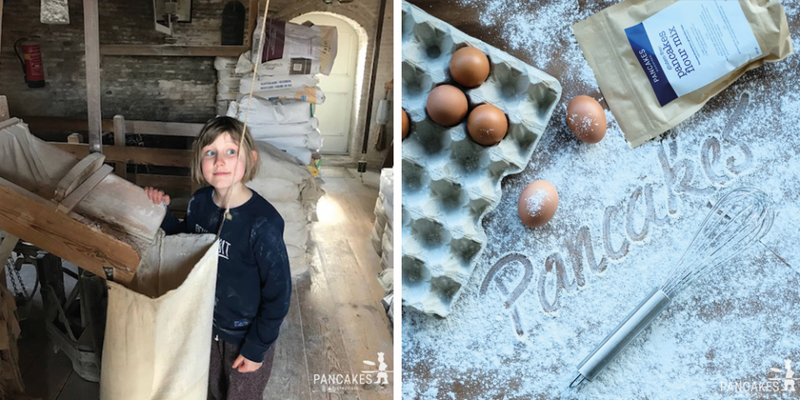 Would you like to know how we make our delicious pancakes?Just check our YouTube-channel for videos on how to make our pancakes at home! Would you like to buy the best pancake flour mix? Just visit one of our restaurants or our website! The mill ‘De Windotter’ belongs to one of the largest mills in the Netherlands and has been fully operational since the restoration of 1986/1987. Miller Maarten Dolman runs the mill company on behalf of the 's-Heren Korenmolen foundation in IJsselstein. His wife Lia takes care of the mill shop and acts as hostess at breakfast and lunches in the teahouse. Son Karel follows the training for miller and millmaker. Dozens of volunteers for the work in the mill, the sale in the mill shop, the writing and circulation of the 'Windotter nieuws' and the many 'Participants' and 'Friends of the Windotter' contribute to the success of the milling operation. The flour mill occupies a special place in the IJsselstein community. The daily activities at the mill site and the almost always turning blades ensure that it is not a 'cold' monument, but that the dynamics of the working mill give it a unique position within the Dutch mill. The slogan 'Gang is everything' has become the common thread in the management and organization of all mill activities. The influx on the mill yard is therefore great. From baker to home baker, from hiking tourist to full coaches: The Windotter is for every interested person a fascinating and rich experience! According to the original mill, three pairs of stones are located on the stone loft of De Windotter: one pair of '16er' blue and two pairs of '17er' artificial stones. One pair of artificial stones can be driven by an electric motor. There are also two mixing kettles, a flower basket (a sieving machine for obtaining white flowers), a wheat letter from 1913, a vertical grinding chair to break, a sowing ladder, two transport jacks and a silo space of 20 tons. The mill has five attics: grain, grinding, brick, louvre and roof attic. On the stone loft is a stone crane to be able to lift the approximately 1000 kg heavy top millstones (runners). The grinding stones can then be sharpened manually with the aid of bilge hammers. Depending on the wind, the grinding capacity can amount to approximately 2000 kg per working day. The sail cross has a 26 meter flight and is equipped with breeding wicks with signs and automatic brake valves. The hood is covered with wooden shales.